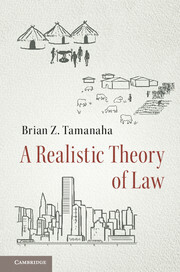 A REALISTIC THEORY OF LAW, by Brian Z. Tamanaha. Cambridge: Cambridge University Press, 2017. 208pp. Hardback $110.000. ISBN: 9781107188426. Cloth $34.99. ISBN: 9781316638514. Reviewed by Joshua Turner, Department of Philosophy, Utica College; MAIR candidate, American University School of International Service. Email: jaturner1@utica.edu. In one of the later chapters of his book, A REALISTIC THEORY OF LAW, Brian Tamanaha remarks that “Once a label and corresponding conceptual implications take hold... they are hard to dislodge” (p. 154). While speaking specifically of international law in this instance, it could be fairly applied to the entirety of what his book is attempting to achieve. Despite the use of “realistic” in the title, Tamanaha argues for what international relations theorists might call a constructivist view of law; that is to say one which is heavily influenced by both social and historical considerations. For Tamanaha, the “nature” of law is reflected in the meaningful actions of societies and people and, perhaps most importantly, could have been constituted differently (p. 80). Law, as it is currently viewed, is not a linear progression towards a destination that was necessary. To put it in Platonic terms, there is no ‘form’ of law which all things that wish to be law necessarily bend towards. Tamanaha clearly expresses his objectives for the book early on, with a stated goal of “articulat(ing) a realistic theory of law, and more generally to demonstrate the significance to jurisprudence of theories that center on law in society” (p. 2). What people say and think about the law is of greater importance than what is actually written down on paper; this pragmatic and empirical approach to understanding law is the bedrock of what is to follow. Tamanaha calls this a “social legal theory,” which has its roots in the historical school of jurisprudence (pp. 12-24). He is also clear in pointing out that his is only one interpretation of social legal theory among many and that it is quite possible for two social legal theorists to have very different views on what constitutes it; this is a diversity found less often in the positivist or natural law interpretations (p. 29). Thematically, the book has a good flow and progresses smoothly from foundations to more specific concerns. At no point does Tamanaha get “over his skis” and tackle issues that have not at least been touched upon in earlier sections. This approach of building from the ground up (much like his conception of law itself) again lends to the ease in reading what could otherwise be very convoluted and nebulous. While making his points, Tamanaha pulls no punches but is charitable to countering views. Arguments are always made in good faith and it does not seem as though he is taking the worst interpretation possible of those with which he disagrees. Tamanaha describes a jurisprudential landscape dominated by two main branches of jurisprudence: an analytical or positivist perspective and the Law of Nature or natural law (pp. 12-13). The third prominent view, a historical one which was positioned directly against the universalism of natural law, would eventually become what we now call the social branch of jurisprudence. The empiricism of the Enlightenment, through the works of Montesquieu, Savigny, and Maine, among others (pp. 15-19), would greatly influence this branch of jurisprudence, with an emphasis on law as a “living organism” that must change with social norms and accepted practices. For Tamanaha, a potentially difficult aspect of engaging with social legal theory is that for many its tenants are often accepted as a kind of truism and thus it is not given the thought and academic rigor it deserves. From this beginning, what follows is a thorough examination of social legal theory and how it fits into the grander scheme of jurisprudence and how we think about law. Perhaps most interesting in this chapter is the juxtaposition of empirically based social science with philosophy in regards to their ability to identify universal truths, so far as they [*2] exist, about law. While Tamanaha effectively rebuts this notion in a later chapter, it remains a constant theme throughout the book. As is noted in a footnote (p. 36), while legal philosophers are quick to disregard the ability of social science to tell us what we ought to think about law, because it is limited to telling us what the predominant social thought regarding law of the time is, scientists have long been hostile to philosophy encroaching on what they increasingly see as their domain. Tamanaha makes clear that neither the social approach he posits nor those in the contemporary analytical school, can provide all the answers alone (p. 37). In Chapter two, titled “What is Law?,” Tamanaha puts forth the view that “law involves multiple social-historical phenomena that have taken on different forms and functions in different times and places and therefore cannot be captured by a singular definition of law” (p. 38). Society is in a constant flux and therefore attitudes about laws and law itself are very likely to be in flux as well. Indeed, if one were to show an American from the early 1800s what our current laws are, it would likely seem just as incomprehensible as prior laws pertaining to slavery or women’s rights are to us now. It is not just that the laws themselves have changed; societal attitudes that will ultimately shape conceptions of the law have changed as well. In the same sense that a coach is fired by the fans and the general manager just delivers the verdict, so too do judges not make law, but rather make concrete what the society or community already believes (p. 39). Law then is a bottom-up endeavor rather than something that is imposed upon a populace in a hierarchical fashion. Additionally, law cannot simply be defined as “what the state says and enforces” because the state must be responsive to social changes in order to maintain legitimacy. But what if social changes move in such a way that previously immoral systems such as slavery or immoral acts such as murder or theft, become socially acceptable? An argument could be made that in an ethically relativistic system, where there is no absolute right and wrong, laws could change to enshrine truly harmful practices. The problem with an argument of this nature is that a society in which these practices were accepted is not likely to succeed for very long. Because a society’s chief purpose must be its survival, it is unlikely to come to a consensus on practices that would have the opposite effect, at least for any extended period of time; this acts as a kind of natural defense against laws which prove to be destructive or harmful. As an international relations theorist, and someone with a skeptical view of international law, I was most interested in seeing a thorough defense of international law, and here Tamanaha does not disappoint. My main objection to international law has been on the grounds that there is no enforcement mechanism; legitimate coercive force is required to compel people to follow the law and in the absence of this, one has only norms at best. Tamanaha convincingly argues that countries follow international laws more often than not on the international stage. They compel themselves, which fits neatly with his overall social theory of law, except this time the society inside a country is replaced by the international community of states. Just like there are people who might not agree with certain laws but still follow them because of the societal implications, not every state will always agree with the statues of international law. But even countries as powerful as the United States are often constrained by international law, without a greater power to compel them. One would not be likely to argue that just because a law has been broken the law is no longer said to exist. Such is the case when international laws are broken. Tamanaha has made a valuable contribution to not only the study of jurisprudence, but also many social scientific fields that touch upon legal concepts. The arguments are thorough and insightful, even for those who may be inclined to disagree. The book is written in clear and precise prose, with limited legal jargon or specialized language, which makes the book eminently readable even for those non-legal theorists among us. As opposed to abstract concepts, Tamanaha uses relatable examples, such as sports teams or the creation of the Department of Homeland Security. Because the book is written from a social science perspective, focusing on [*3] an empirical approach, the book will have value to a multitude of disciplines; philosophy of law, political science, economics, sociology, psychology, and even anthropology could all potentially find useful insights in this work. Because of this, the writing style serves its broad audience well. Both laymen and those deeply enmeshed in the field of jurisprudence will find uses for this work. © Copyright 2019 by author, Joshua Turner.